I understand that there is a cancellation fee specific to each program. If you need to cancel and get a refund, contact your local program coordinator printed on your online program registration receipt. • For all cancellations, there will be a processing fee on all VVM program fee refunds. • No program credits will be issued. • If a participant decides to leave the program (except in case of emergencies), no refunds or credits will be given for program fees and expenses. Note: all credit cards charges will read Ved Vignan Mahavidyapeeth. The techniques and processes taught on all VVM Programs- Courses and Events- (including but not exclusive to Art of Silence, Art of Silence Intensive, Blessings, Guru Puja and DSN Programs) are powerful and effective when learned under the personal guidance of a trained teacher in the environment of these Programs. These techniques and processes are offered to program participants for their own personal development and only under the strict personal supervision and guidance of Sri Sri Ravi Shankar or his trained teachers while on these VVM Programs. The techniques and processes taught on VVM Programs are confidential and are to be used by program participants only for their own personal development. By signing this Agreement below it is hereby agreed by the program participant and Ved Vignan Mahavidyapeeth that these techniques and processes are private in nature and will not be practiced or taught outside of the environment of these Programs without the written permission of Ved Vignan Mahavidyapeeth. It is also agreed that if the Program Participant is given a process or technique for home use, that it will be kept private and not be passed on to anyone, either written or verbally, without the written permission of Ved Vignan Mahavidyapeeth. By signing below, the Program Participant also agrees to abstain from taking notes or making recordings of any processes or talks while on these Programs. The undersigned hereby gives permission for any necessary medical care to be given to myself in case of accident or illness. I agree to take full responsibility for the costs of any treatment provided. I hereby give the irrevocable and unrestricted rights to use my performance and participation (in whole or in part), image, name, voice, and likeness for all non-commercial written, audio and/or visual presentations. I understand and acknowledge that the written, audio and/or video presentations may be used in print, broadcast and online promotions for the purposes of advancing the Art of Living Foundation around the world. For programs hosted at the Art of Living Retreat Center, the undersigned agrees and does hereby release from all liability and hold harmless the Business (Art of Living Retreat Center, Blue Ridge Preservation, Inc. VVM & its sister organizations) and any of its employees, officers, directors, volunteers etc. representing or related to the Business. Parent or Guardian of a minor child does hereby accept full responsibility for said minor while on Premises (136 Virgil Day Road, Boone, NC 28607). Execution of the Liability Release Agreement by a Parent or Guardian does hereby cover any minor child. Participant releases the Business from all liability and holds harmless the Business for the minor child. This liability release is for any and all liability for personal injuries including death and property losses or damage, including of personal property, in connection with any activity or accommodation of the above mentioned Business. The undersigned does hereby further agree to abide by all the rules and regulations that are presented by the Business. Applicable Law: The above contract shall be governed by the laws of the State of North Carolina in Watauga County and any applicable Federal Law. I acknowledge that all components of this program are exclusively wellness-based approach from the traditional knowledge of Ayurveda to empower an individual for a healthy life. I acknowledge that no member of the Sri Sri Ayurveda staff and contractors will diagnose any disease or disorder, nor prescribe any medical substance or treatment. I have been advised that this consultation is not a substitute for consulting my physician for medical care. I further understand that the massages and other techniques, treatments or recommendations, which may be offered during this Program are not intended to treat, cure or diagnose any disease or disorder but are used exclusively for a wellness based approach for a healthy lifestyle. I acknowledge that I do not have any physical conditions or physical limitations which would prevent me from participating in the Program or would limit in any way my participation in any aspects of the Program. I do hereby release, indemnify, save and hold harmless the Organization, its parent, Sri Sri Ayurveda products and supplements, Shankara, Inc., Physicians and Ayurvedic Doctors (Vaidyas), and their directors, officers, employees, staff, agents, volunteers, consultants and contractors from and against any and all claims, liabilities, damages, or losses, including any costs and attorney’s fees, arising from any activity, treatment or therapy provided. Further, as a material part of the considerations for allowing me to participate in the Program, I hereby assume all risks of injury to my person or damage to my property arising from my participation in the Program with the exception of willful or intentional misconduct on the part of the parties hereto. It is my intention that this be a complete and unconditional release of all liability to the greatest extent allowed by law. I acknowledge and represent that I have sought the advice of my family doctor and any specialists with whom I have consulted regarding my participation in the Program, that I have shared with such physician(s) the attached Memorandum which outlines the scope of the Program, and I have been advised that I do not have any physical conditions or physical limitations which would prevent me from participating in the Program or would limit in any way my participation in any aspects of the Program. I hereby acknowledge that I have read and fully understand the attached Memorandum which outlines the scope of the Program for which I have registered. I do hereby release, indemnify, save and hold harmless the Organization, its parent, Sri Sri Ayurveda products and supplements, Shankara, Inc., Physicians and Ayurvedic Doctors (Vaidyas), and their directors, officers, employees, staff, agents, volunteers, consultants and contractors from and against any and all claims, liabilities, damages, or losses, including any costs and attorney’s fees, arising from any activity, treatment or therapy provided for the undersigned at Blue Heaven Spa and Art of Living Retreat Center. This Waiver, Release and Consent Form shall be governed by the laws of the State of North Carolina. 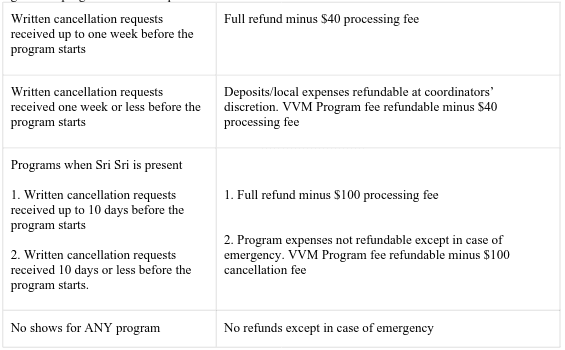 • For all cancellations, there will be a processing fee on VVM program fee refunds ($40 processing fee, $100 processing fee on programs with Sri Sri present). This agreement is entered into by and between Ved Vignan Mahavidyapeeth on behalf of itself and its affiliates and licensors (“Organization”), and you as user of this website and potential participant in one or more programs of learning administered by the Organization (the “program” or “programs”). Our websites will sometimes invite users to provide us with their comments on our services or on certain programs. Users who wish to provide us with their comments will sometimes have the option of also providing us with their name and email address. We do not require users to provide us with such information, however. Comments provided to the Organization by users may be posted on our websites. Alongside such comments, we may also post the user’s first name and last initial as well as the city and province that this user has indicated he or she is from. However, we will take measures to prevent such postings from containing any personal information. • To our subsidiaries and/or affiliates. • If we believe disclosure is necessary or appropriate to protect the rights, property or safety of the Organization, our customers, or others. This includes exchanging information with other companies and organizations for the purposes of fraud protection and credit risk reduction. You may send us an email at [email protected] to request access to, correct or delete any personal information that you have provided to us. We cannot delete your personal information except by also deleting your user account. We may not accommodate a request to change information if we believe the change would violate any law or legal requirement or cause the information to be incorrect. The Organization also uses “web beacons” (also known as “web bugs,” “action tags,” “pixel trackers,” or “clear GIFs”), which are small, graphic images on a web page, web-based document or in an email message that are designed to allow us or a third party to collect certain information and monitor user activity on our sites. Web beacons are invisible to the user because they are typically very small (only 1-by-1 pixels) and have the same color as the background of the web page, document or email message. We may use web beacons to collect non-personal information such as the IP address of the computer that the web beacon is sent to, the URL of the page the web beacon comes from, and the time it was activated (such as when you view the web page, advertisement or email that contains the web beacon). Web beacons can be linked to personal information, but we do not use web beacons that link to personal information. We may permit third parties to place web beacons on our sites, but these web beacons are not linked to personal information either. The Organization maintains log files, which contain Internet Protocol (“IP”) addresses. An IP address is a numeric address that is assigned to your computer by your Internet Service Provider. We do not link IP addresses to personal information. In general, we only use log files to monitor traffic on our websites and to troubleshoot technical problems. In the event of abuse, however, we may block certain IP addresses. • Except as expressly set out in this Policy, we will not disclose your health-related information to any third party except with your prior written authorization, as required by law or in case of a medical emergency, as described below.